Add a calming, breezy look to your kitchen with the Charmain kitchen cabinet. The modern and contemporary-inspired design features clean, straight lines. The Charmain is finished in a light oak for a natural look, with a complementing white finish on the cabinet's door faces. Dimensions 16.54 In. X 35.43 In. X 33.46 In. Extremely unhappy. I do not recommend this to anyone. The packaging it came with is Styrofoam and badly damaged, so Styrofoam everywhere. Corners on all pieces broken and damaged. Instructions are for people with an IQ of 300. All it is is photos. I am single so I do not have a Husband to help fix this. Like others may. Have somewhat put together regardless of the damage. The doors and drawer do not line up. This was cheap and on sale so it is far from optimal to take the time and resource to send the garbage back. I think I will look elsewhere for what I need and give this to the dumpster. I need a new good size microwave cart that will fit my microwave and this one, I hope will fit it. 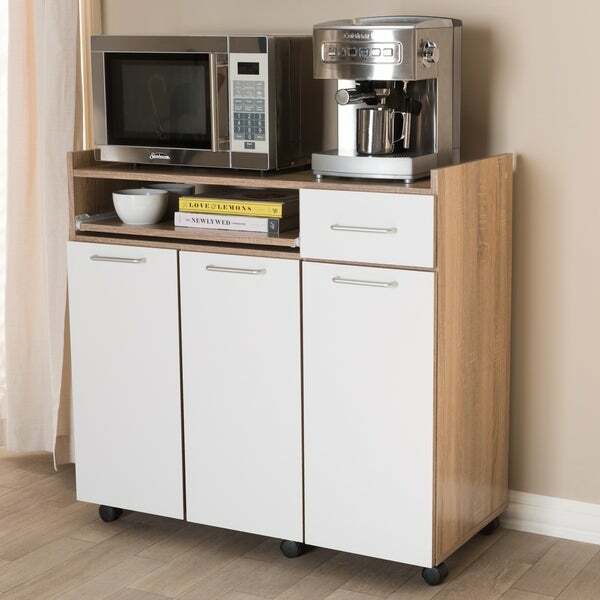 The extra storage is a huge plus; I just wish you had it in dark brown to match my kitchen. Also, measurements would have been a good idea so I could know the exact size of the cart. There are measurements. It says 33.46 inches high x 35.43 inches wide x 16.54 inches deep. It weighs 77.16 lbs.